Michael Rehr served me in handling a complex condo association matter that required deep understanding of both real estate and condo association law. Furthermore, the matter required a lengthy reconstruction and analysis of years of financial records, as well as a detailed understanding of transactions that the association managers did in an attempt to take advantage of me. Michael very skillfully applied his deep knowledge of the law and his analysis of the financial data to debunk, disprove and reverse various assertions that the condo association was claiming against me. During the entire process he kept me informed as to what was happening, but didn’t confuse me with details that were not meaningful to me. I greatly appreciate how he distilled these complex things and communicated them to me in a straight forward and understandable way. As much as I was impressed at his legal acumen was Michael’s ability to help me think clearly through all my options and keep me level headed. Michael made it so I achieved the best possible outcome in dealing with my matter. I was highly pleased to have Michael Rehr on my side. If you are looking for help with condo association or real estate matters I highly recommend Michael Rehr. I’m so truly grateful to you for everything you have done concerning my lawsuit… couldn’t believe that a stranger, who was an attorney, would help me with this situation, regardless of the fact that I could not pay you for your services… Right from the start your assistant Karen would call me almost every week for copies of information about HOA. Both of you calling me almost every week made me feel that you genuinely cared for me as demonstrated by your actions and your diligence concerning my case… I can also attest to your skills as an attorney which changed everything. I’m so truly grateful to you for everything you have done concerning my lawsuit. Since that first phone call I received from you, and you took the time to hear the story about my colon cancer in 2004, when I couldn’t work for a year and a half due to my illness. Medical bills were piling up. Then during a turn of events in the economy from 2006-2009, jobs were very scarce and hard to find. I only had a part-time job, two days a week, I could only afford to pay my mortgage, electricity, water, gas bill and my 1994 Cherokee Jeep. When it rains, it pours, on top of that, I lost my mother who passed away in May of 2014.This is where I was at that moment in time, but enough about my life. I recall Monday August 31, 2015, when I received your contact information. You asked me to send you a copy of the lawsuit presented to me by Carmel at the California Club Condominium Association and Home Owner Association. I did not sleep that week and couldn’t believe that a stranger, who was an attorney, would help me with this situation, regardless of the fact that I could not pay you for your services. I never imagined it could ever happen that I’d be faced with losing my apartment that I worked so hard for and never missed a payment since 1996. On Wednesday September 2, 2015, you sent me an email accepting my case pro bono. I still can’t believe it! We communicated strictly by phone and I was always nervous when I had to speak with you. My mind would drift into clouds and I felt hopeless and powerless. Right from the start your assistant Karen would call me almost every week for copies of information about HOA. Both of you calling me almost every week made me feel that you genuinely cared for me as demonstrated by your actions and your diligence concerning my case. There are no words that could ever fully express my gratitude. “THANK YOU” Michael Rehr for your help, advice, support and especially your genuine kindness! You really got me through a very sad and trying time in my life. I value you highly. You’re a very admirable person. I can also attest to your skills as an attorney which changed everything. I pray God bless you with health and grant you success in your professional life and in all you do. “Michael Rehr has represented our family for many years in a series of condominium related matters, including the recent sale of the condominium where we lived for many years and the purchase of our present condominium home. The sale was extremely complex and difficult and was finally completed only a result of Michael’s superior legal skills and perceptive and pragmatic business judgments. More importantly for our family, Michael consistently provided counsel to our family that was sensitive to our needs and guided us away from our own occasional poor emotional judgments. 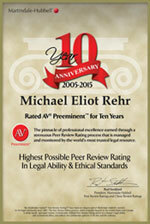 “Michael Rehr is the consummate professional with a solid foundation based on impeccable educational credentials and the requisite experience to expertly accomplish the best representation for his clients. Moreover, he has the unique skillfulness and wisdom to apply the law in a most pragmatic manner. He is a straight shooter, tell-it-like-it-is kind of lawyer who holds nothing back. His advice may not always be the one that his clients want to hear, but the high ethical standards that Michael holds in his heart always compel him to do the right thing. I know him to be an extraordinarily attentive professional; his turnaround time is very quick and he always exceeds his clients’ expectations in this respect. Rafael R. – Property Manager, CAM. “I have worked with Michael on legal issues on more than one occasion and find him to be very results-oriented, professional and responsive. He is excellent counsel and does an outstanding job of providing details, options and probable outcomes for any legal situation. I find him to very easy to work with and will not waste your time or money in providing the straight story.